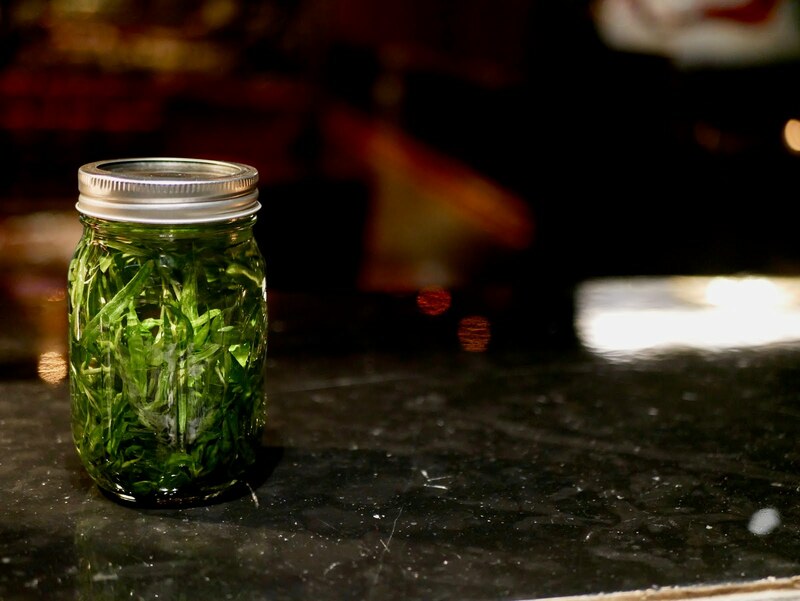 Tarragon gin infusion before sous-vide infusion at 65ºC. Not a lot of posts these days - I know. And I have been quite busy anyway (yeah, I know: as always). Now - I have to admit something: while my tarragon infusion worked perfectly at home (color-wise) - it has been not really successful on work. The aromas of tarragon were all there - but you have had (again) this faint light yellowish green. It seems though, that I found the culprit: too low alcohol! Even at 47% abc Bombay Sapphire isn't strong enough. When I used alcohol which has been around 70% it worked like a charm. In the first hour (room temp) the alcohol slowly turned in a light green (but a more "unnatural" green with less yellowish hints). Heating it up to 65ºC It turned within another hour darker - but afterwards adding it into an ice bath, made it vibrant green. Well - I have to admit, that the mint infusion has been more vivid green, but this is maybe also due to the type of herb. So yes - I can now say the project has been completed: I achieved a green which is usually not achieved by any home-craft - and I haven't seen another bar achieving this.